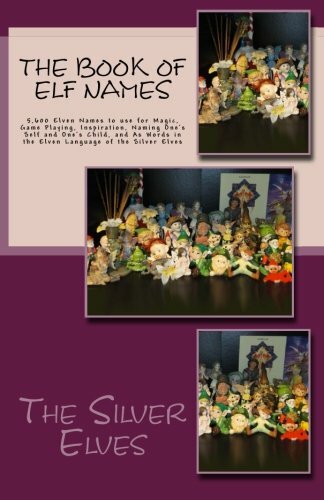 For decades the Silver Elves have been gifting magical elf names to those needing a bit of encouragement in their awakening sense of their elven or other natures. We've also received request for elf names from game players, writers, people wishing to name their babies and many more. In The Book of Elf Names: 5,600 Elven Names to use for Magic, Game Playing, Inspiration, Naming One's Self and One's Child, and as Words in the Elven Language of the Silver Elves, we present these elf names (along with their pronunciation and English translation) as inspiration for those who wish to create their own elven names, although we still gift names and those desiring one from us can read about requesting one here. This book is dedicated to all the elves whose names are contained within and to Silver Flame who insisted we publish them. You may also be interested in our book Arvyndase (Silverspeech): A Short Course in the Magical Language of the Silver Elves, which contains a short course in using Arvyndase, which means SilverSpeech, a 33,000+ word language created by the Silver Elves. There are nine chapters in the book with 30 lessons in each chapter or 270 lessons altogether. The book uses a process of word substitution to gradually introduce the student to the use of the language while it speaks about the language itself, its creation, and the philosophy of the Elves. It is a language primarily created to be used in magic spells, rituals, and incantations. This book also includes a chapter of spells in Arvyndase, three scripts for use with the language, and a small dictionary of words used in the book for easy reference. 5,600 Elven Names to use for Magic, Game Playing, Inspiration, Naming One's Self and One's Child, and as Words in the Elven Language of the Silver Elves on Amazon.com. The book is priced at $15 and its purchase is eligible for Amazon's free Super Saver Shipping (Amazon's deal to ship you free if you purchase a total over $25 in a single or combined book order). Please click the Amazon link below and go to Amazon's Silver Elves page to make your purchase. For a preview of the book, you may wish to check out Amazon's "Look Inside This Book" feature that is offered. Remember that you will be going out of the Silver Elves website, so please bookmark us before you go and return often. Zardoa Silverstar has been giving out names for ages. He began giving elf names before he entirely realized he was an elf. The first ones he gave were in English. Thus he gave such names as Debbie Moondust, Morning Moonstar, Silver Flame and names of this kind. In time, he began to give names with a more direct elven tone such as Kartakor and Kendor. In the 1990s when he began creating our elven language Arvyndase or Silverspeech (see our book Arvyndase (silverspeech): a short course in the magical language of the Silver Elves) and with the advent of the internet, he began giving out Arvyndase names, which are the 5, 600 names you will find within this volume. We created a place on our website (http://silverelves.angelfire.com) where elves can request a magical name and we give instructions there on the information that we need to do so. Over years, besides elves, we also have received a few requests from dwarves (see if you can figure out which are the dwarven names) and otherkin of numerous sorts. We also have gotten requests from writers wanting elf names for stories they were creating and from gamers desiring names for their characters. We have obliged as best we have been able, although we encouraged the writers to create their own names. We elves always encourage creativity. Every elf name is unique. It may be a variation of another name, as in English there is Sue, Susan, Suzette, Suzanne, etc. and this is the case in Arvyndase, as well. However, unlike most other languages we dont repeat names. We dont have hundreds of Johns, Michaels and Tiffanys and Deborahs. Alas, while we have given out over 5,600 names (we still receive requests), the vast majority of those who receive names never use them. It is not wrong to use a name from this book that is not being used, but it is considered highly rude by the elven to use a name that someone else is using and no elf would want to do that. And perhaps even worse, it is considered uncreative to do so. So before using any name in this book please do an Internet search to see if it is currently in use. Far better, from an elven point of view is to request a name from these elves at the site listed above, or through Facebook. Or perhaps even better still, to use this book as an example of the names that are out there and to create a variation of a name that you like. For instance, we currently have Våvardor and Våvardorn but there is not, as yet, a Våvarthor, or Våvardorys, or Våvardoryn, etc. Remember, however, we are still giving out names, so even when creating a variation, you may wish to do an Internet search. No elf would want a name that another is using; although using a name that has been cast into someones magical mystical trash-bin is ever fair game. Of course, one might ask, if creativity is so important to the elves, why give elf names at all? And that fact is that most of the names we give are gifted to those who have just discovered their elven nature and need a bit of encouragement. Giving them an elf name is giving them a bit of elf magic and power. When we gift each name, we also indicate how the name may be pronounced but it is up to each elf to put emphasis where it feels best to them or alter the name to suit ones own self. How it sounds, how it vibrates in ones ear, soul and imagination is most important.